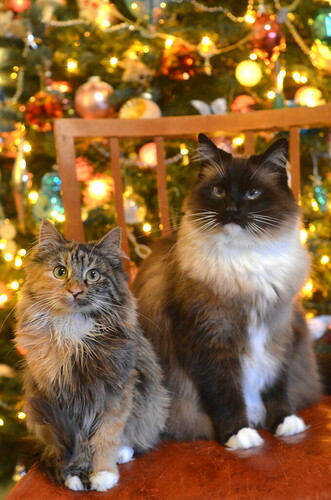 The Itty Bitty Kitty Committee: Wishing You All a Wonderful Holiday! May your stocking be filled with many treats! And may your home be filled with blessings and love to the fullest, too - Merry Christmas, Laurie and Craig, and may your blessings be doubled through the year! Beloved Bean and Winsome Wylla, may you enjoy even half the joy you provide to me; you'll be merry the whole year long. Merry Everything and Happy Always to all of you! Thank you for bringing so much joy and silly smiles to my life every day. What a year it has been! Here's to continued good health and happiness for all of you in 2014. Blessings to you and yours this holiday season and throughout the year for the simple joy you bring to us all ! My heavens, that's a lot of floof! Happy Christmas to all of you from sunny Tucson! I am all glow-y inside just looking at that picture. Laurie and Craig, thank you for fostering kittens and sharing them so beautifully with us. Charlene and Wylla, thank you for being the very most splendid kitties I've never actually petted. Merry Christmas to all of you! A very Happy Christmas to all of you, Laurie. Thank you for another year of delight, and I hope the holidays are all that you could wish them to be for you and the entire family! I'm just starting to follow you. My husband and I have four beautiful cats! We love them so much and we love all cats! Happy Holidays! See you in the New Year! Blessings galore to you all. "Thank you" seems so inadequate for all the joy, light and love you've brought into our lives.